I had the best weekend. I flew home to Alberta to surprise my sister who was running in a race in Banff. I got to spend the weekend with my mom, niece and sister. It was the first time since having kids that I was away from all 3 at once. That’s 6 years of having kids at my legs with no break to speak of. The break was a much needed. While I was waiting at the finish line for my sister I was looking at the faces of the runners. The majority of the runners looked like they were in agony. Those were not happy faces. I really don’t get the whole running thing. And here of course is my problem. It is so hard to find time in my already very busy day to do something I dislike doing. It’s not just running but pretty much all forms of vigorous exercise that I deplore. I remember in 7th grade having to run for gym class. Our route was through several neighborhoods. I would start out with everyone else and then purposely fall into last place. Then I would take a shortcut by cutting through several yards and jumping fences. (Jumping fences – that’s exercise too isn’t it?!) A couple of times I even remember stopping by my house and hanging out for a bit before I (and a couple of my similarly minded best delinquent buddies – two of which I was able to see this weekend!) would fall in behind the rest of the group for the final stretch back to the school. I still wound up at the finish line feeling like I wanted to puke. Running has never been my thing! But Kudos to my sister for running and finishing!! Love you sis!! A couple of days back I woke up craving pancakes. I didn’t really want the better for you coconut flour pancakes. I wanted the full-on carb loaded, sinful ones. The family loves them but it is rare that I make them anymore simply because of the guilt of serving a plate full of simple carbs topped with sugar. The kids and hubby happily scarfed them down. I had two small ones without syrup, topped with eggs. They were so good. It was a real feat in self-control not to eat several more. I figured that two shouldn’t be too bad in the carb count. Wow! Was I wrong. Clearly I just can’t eat like that anymore. Today, hungry and clueless about what to have for lunch I came up with this. It was decadent. Despite being low carb I felt like I was indulging. It was quick to fix up too. Of course the kids wouldn’t touch it, especially after the carby ones so fresh in their minds. These fit the current criteria: grain free, sugar free and dairy free. With the coconut cream on top I really didn’t miss the butter that usually is abundant on any pancake of mine.Click here if you want my How To Tutorial on making your own almond flour. Defrost berries and set aside. Mix flour, salt, eggs, nutmeg and oil in a medium bowl. I used my cast iron frying pan. Heat a generous amount of coconut oil over medium heat. When the oil ripples add enough batter to form 3 inch pancakes. If you keep them small they are easier to flip. Flip when bottom is browned to your liking. 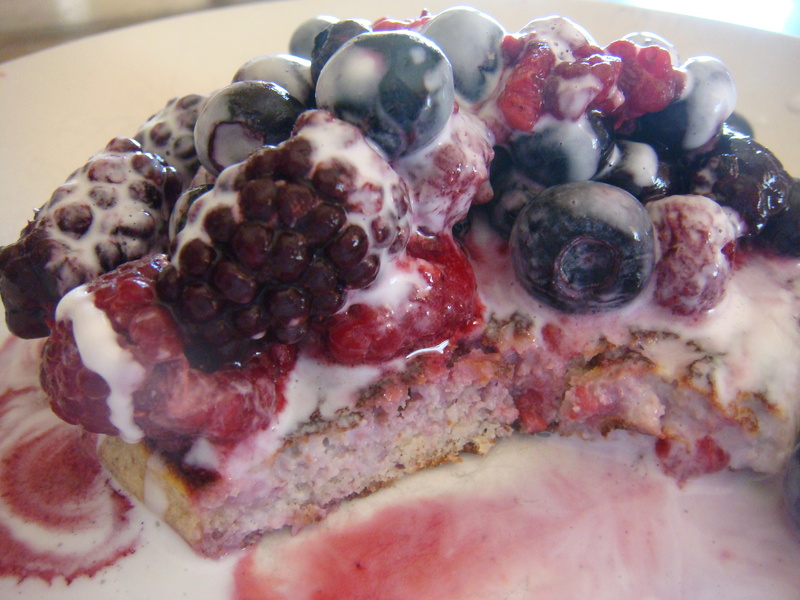 Top pancakes with berries and then drizzle with warmed coconut cream. You will feel like you are cheating when you aren’t! Hia, exciting recipe but I’m confused – you heat the coconut cream in a small pan, but then it doesn’t get another mention, is it in the batter? Dos it get mixed with the flour, salt, eggs, nutmeg and oil?